Northern Reflections biggest sale of the year has begun. 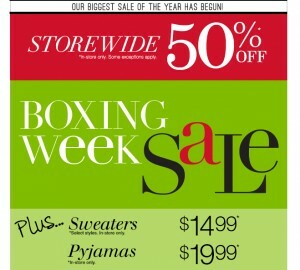 This Boxing Day / Boxing Week 2014 Northern Reflections has 50% off EVERYTHING Storewide. This Boxing Day offer is valid in-store at Northern Reflections stores only. Some exceptions may apply. 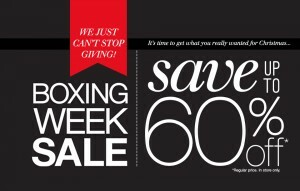 Northern Reflections Boxing Day/Week sale is here! "It's time to get what you really wanted for Christmas…"
Save up to 60% off regular price in-store at Northern Reflections.